Complete independence is a basic to the spirit of our current mission. This mission has been taken up before all nations and history. While taking up this mission, we carefully considered feasibility of carrying it through. However, these considerations resulting in faith and an enhanced view, point to our success. We are the men who took action in such a manner. Due to the mistakes made by predecessors, our nation was living in a so-called independence. All things considered, Turkey’s lagging behind the civilized world is the result of previous faults and their continuation. As a result of repeating these mistakes, certainly the country and the nation may abstain from all dignity, honor and ability to survive. We are a nation that wants to live in dignity and honor. We can’t bear to remain deprived of these features as a result of continuing mistakes. Whether wise or ignorant, all the members of the nation, maybe without understanding in what difficulties they are, are determined to unite around an aim and shed blood forever. This is the point upon which our independence is founded and maintained. The basic and immortal principle of nations who have reached consciousness of the real contents, large meaning and high value of independence and freedom, is not to let anyone to damage their independence and freedom at any price, to protect them with all their might and if necessary to shed the blood of the last person, thus glorifying human history with such an example. What is important, is Turkish nation’s leading a life in dignity and honor. This principle can be provided by only complete independence. No matter how wealthy and prosperous a nation is, if it is deprived of its independence it no longer deserves to be regarded otherwise than as a slave in the eyes of civilized world. To accept the protectorate of a foreign power is to admit to a lack of all human qualities, to weakness and incapacity. It is not at all thinkable that those who have never been in such a humiliating state will appoint a foreign master out of their own desire. 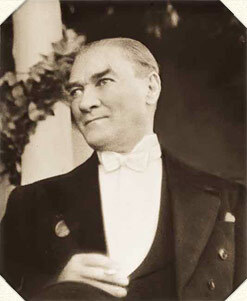 But the Turk is both dignified and proud; he is also capable and talented. Such a nation will prefer to perish rather than subject itself to the life of a slave. Freedom and independence are a part of my character and I am a man who is full of love of independence, which is the greatest and worthiest heritage of my ancestors. My love is known by those who know my family, private and official life from my childhood to this day. Dignity, honesty and humanity are formed in a nation only by having independence and freedom. Personally, I place great importance on the characteristics I have mentioned. In order to claim that I posses these characteristics, my nation must posses them also. I must remain a son of certainly independent nation in order to live. For this reason, national independence is a vital issue. For the freedom- and independence-loving nations, moments of suffering, and their perpetrators, must always be remembered in order to take warning and to stand ready. The vital and basic principle of nations who have reached consciousness of the real contents, large meaning and high value of the independence and freedom, is not to let anyone to damage their independence and freedom at any price, to protect them with all their might and if necessary to shed the blood of the last person, thus to colorize human history with such an glorious example.